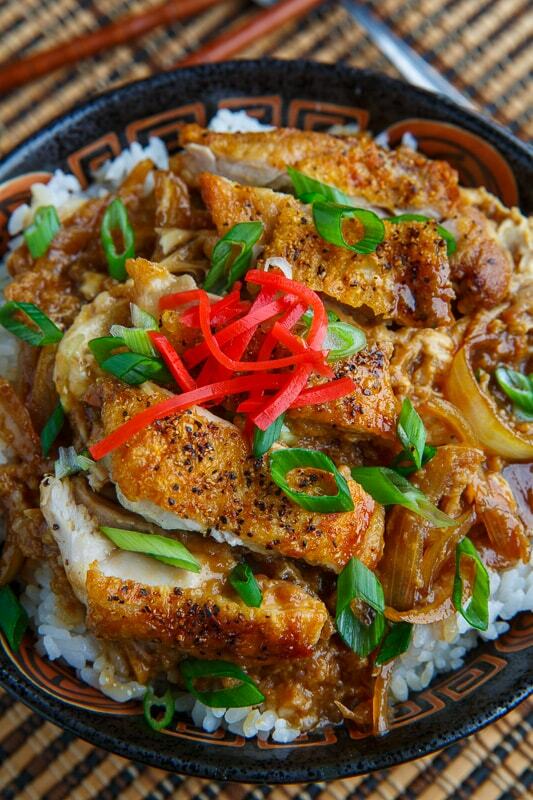 A Japanese style rice bowl with tender chicken and egg in a sweet and savoury onion broth! The other day I was at my favourite ramen joint and I noticed that they had some non-ramen items on the menu including oyakodon! 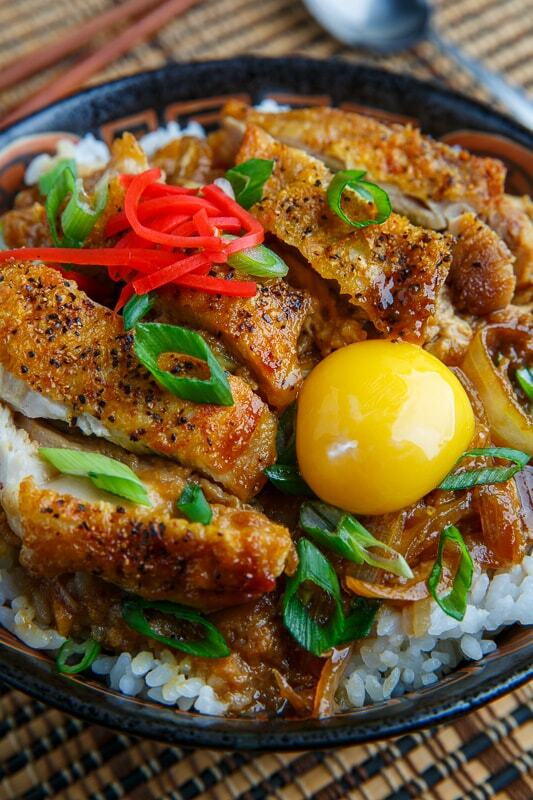 Oyakodon (親子丼) is a Japanese style rice bowl with chicken and egg in a sweet and savoury onion broth. I was a little surprised as I had never noticed anything but the ramen on the menu before and it immediately brought up some nostalgic memories from 11 years ago when I first started Closet Cooking! Closet Cooking first came about shortly after a trip to Japan where I had really enjoyed the food. When I returned I wanted to eat more of the dishes that I had tried there and after going to Japanese restaurants for a few weeks I decided that I would try cooking them at home, since eating out all the time didn’t really fit my budget. I looked for the recipes for those dishes online and came across food blogs where people were sharing photos and recipes that they had made, and they looked amazing! I did not really know how to cook, unless you count throwing frozen dinners into the oven or microwave, so I was learning from scratch and on a whim I decided to start my own blog, as a kind of journal documenting my adventures in learning to cook. I found that I enjoyed it and Closet Cooking grew from there. A lot of the recipes that I shared in the first few months were Japanese including a recipe for oyakodon so when I saw it on the menu, I just had to order it! It was good, though it did not live up to my expectations, so I decided that I would have to make it at home again! This dish is so easy to make! 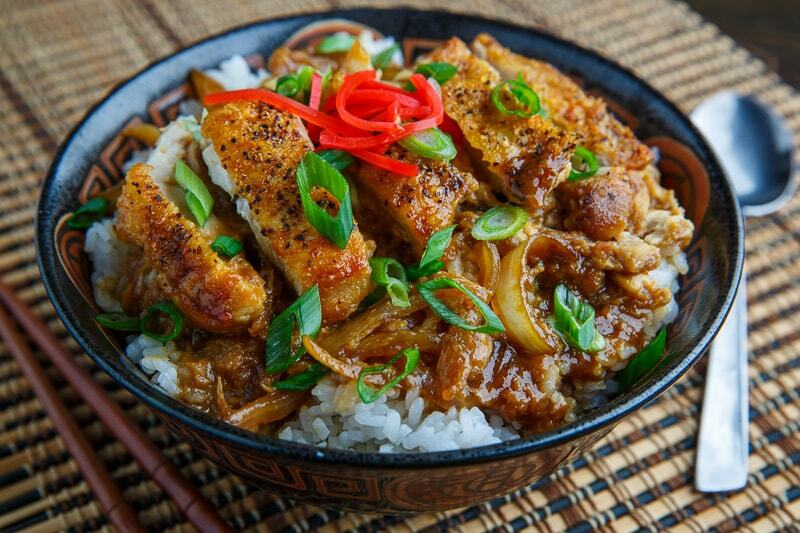 You simply cook the chicken and onions in a broth, typically dashi but chicken broth is also good, seasoned with soy sauce, mirin and sugar before adding the eggs to cook in the broth and serving it all in a bowl on rice. 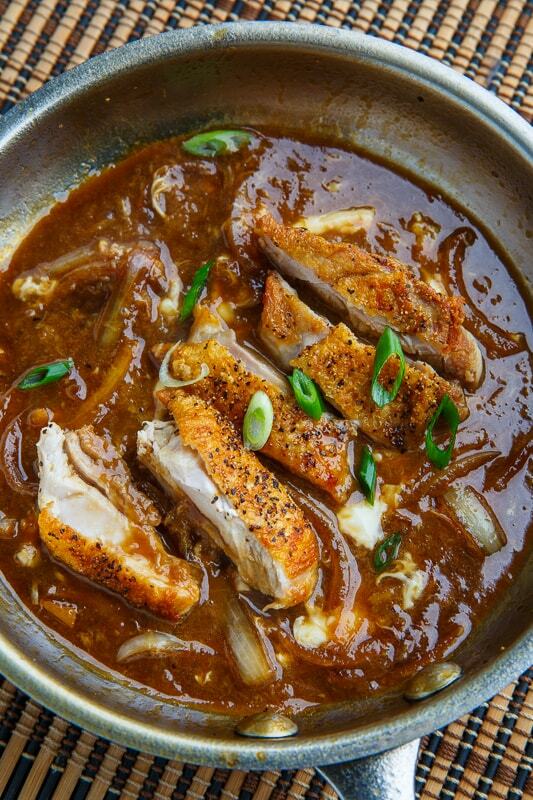 The quickest and lightest way is to cook sliced boneless and skinless chicken breasts in the broth at the same time as the onions but I prefer to go with boneless skin-on chicken thighs as the thighs have more flavour and I am a huge fan of the crispy skin! To get the crispy skin I cook the chicken thighs until the skin is crispy and set them aside before adding the broth and onions and then I return them at the end. All said and done these tasty, chicken and egg rice bowls with their tasty sweet and savoury sauce can be made and on the table in less than 20 minutes! 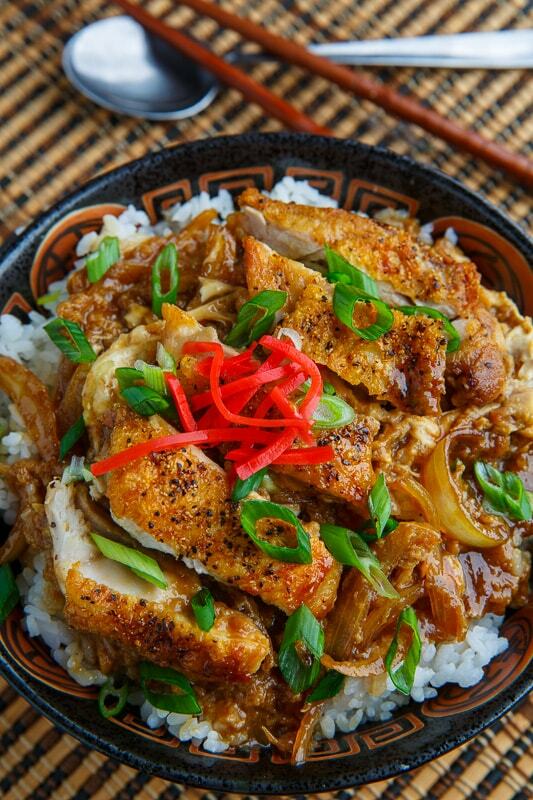 This homemade oyakodon certainly hit the spot and what a great trip down memory lane! The red garnish is beni shoga, a red pickled ginger. Heat the oil in a pan over medium-high heat, add the chicken, seasoned with salt and pepper, skin side down, and cook until the skin is browned and crispy, flip and cook the other side before setting aside. Add the broth, onions, soy sauce, mirin and sugar sugar to the pan and simmer until the onions are tender. Pour the eggs over the onions and broth, top with the chicken, and let sit until the eggs are just cooked, about 1-2 minutes. divide the rice between four bowls, top with the chicken and egg mixture and sprinkle on the green onions before enjoying! Option: Add some extras like sliced shiitake mushrooms! Hi .looks like a good recipe..but i am confused as to the egg…there is a yolk on top of the dish,looks raw..and then in the recipe you say to whisk the eggs and cook under chicken in the broth? it is not clear for me? Looks like a raw egg to me too. Funny this recipe caught my eye and looks yummy as well but I am with you guys. It is a raw egg??? right??? "Top with an extra egg yolk!" It won't kill you, but you can always leave it out. The eggs in the recipe are ALL FULLY COOKED! In Japan rice bowls are sometimes topped with raw egg yolks and I have shown this in one photo; it is completely optional. The FDA recommends using pasteurized eggs if eating them raw; I have added a link. Made this for supper tonight, and it was really good! Just made two small changes: I added about 1 tbsp of hot chili paste to the broth, and I divided the eggs – two scrambled and poured onto the broth, and two fried and put on top of each bowl. K&B by the Sea: I love the addition of the chili paste and a fried egg is always welcome! Thank you! I have been looking for a recipe like this. I remembered something I loved. It had been oh so many years I couldn’t remember. What was missing the eggs! A spice too. I have MS, it messes with my memory, gets things a tiny bit jumbled or lost. I used to joke that I wish I could defragg my brain put all the files lined up again. But than I wouldn’t have the fun of finding new recipes to keep things from getting dull. Love your site. Will be making this in a few days.